Chapter 1: Representing Bamako introduces the reader to the city of Bamako, emphasizing popular expressions of urban culture that portray, inscribe, and resound the moral and ethical production of space. 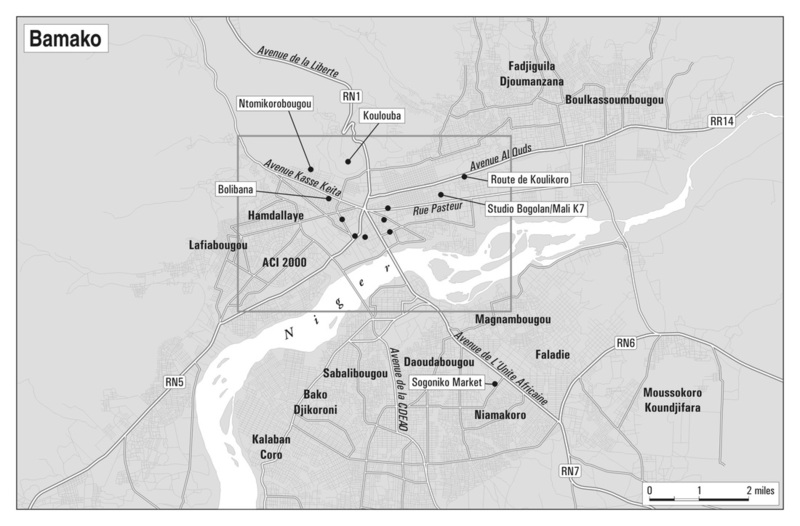 Through theoretical, sonic, textual, and ethnographic analysis this chapter explores how Bamako residents experience and express the civility and wildness of everyday life in an African city. This chapter describes a broad existential disjuncture between sentiments of “civility” and experiences of “wildness” in contemporary Bamako. To what extent is the socio-spatial tension between civil and wild space generalizable? Are other cities comparable to Bamako in this regard? How does public culture (such as music videos, murals and graffiti, and the sounds of everyday life) express and produce morality in Bamako? How is such morality enforced and contested? Again, how does this compare with public culture and morality in other places? How does this chapter employ social thought and theory to elucidate the lived, conceived, and perceived spaces of urban life in Bamako? What is the relationship between theoretical and ethnographic analysis?